Very often in a litter of leopard cubs (I’m going to deal exclusively with litters of two here), one cub is more nervous than the other. Virtually every time a litter first starts seeing Land Rovers and the weird humans that occupy them, one cub will be more willing to show itself; coming out into the open more often and spending less time sneaking furtively behind thickets and clumps of grass. After 6 months or so, both cubs will have hopefully become habituated enough that neither is particularly concerned about the presence of a vehicle(s) any more, but in those first few months, during which time we try to be as sensitive as possible around them, only viewing them when the mother is with them, there is invariably a disparity between the behaviours of the two. We have held many a debate in the ranging/tracking team about which cub stands the better chance of survival; the timid or the brave? We have not been able to come to a definite conclusion. The Nanga female’s first litter from 2013. When a densite is found when the cubs are still young, it allows greater potential to habituate them at an early age, and we generally see them growing up with similarly relaxed natures when a Land Rover is present, as was the case here. A timid cub is likely to hang back a bit more, uncomfortable to do anything unless its mother is there, and what you may find is that its reluctance to venture forth more boldly may hamper its development somewhat. 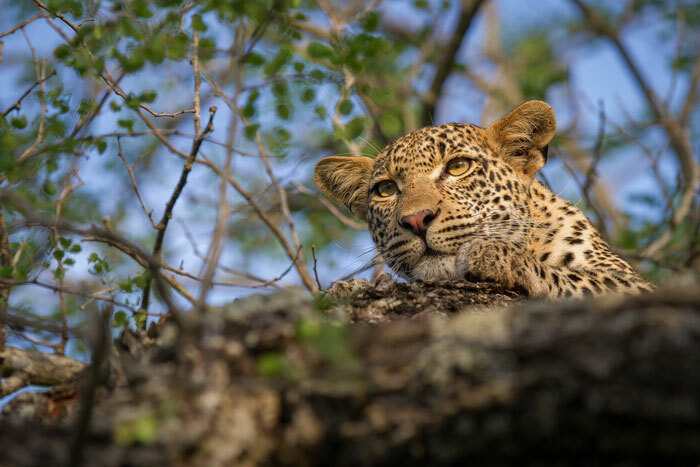 The speed at which a leopard cub develops its muscles, climbing ability and reaction times is going to have a direct impact on its chances of survival, as if danger suddenly looms, cubs need to be able to high-tail it to safety, either up a tree or into a thicket. The cub that is more adventurous seems more likely to develop the necessary skills and attributes to keep it out of harm’s way. It’s hard to appreciate, but the Nkoveni female, now one of our most viewed leopards, was very nervous of vehicles until she was around 7 months old, and decent sightings of her were extremely hard to come by. By the time she was just over a year – when this shot was taken – she was perfectly comfortable with a Land Rover present. Having said this, a slightly more timid approach – even though it may result in slightly slower development time – might actually be a far more effective technique of avoiding trouble in the first place. When being led to a kill by their mother, a slightly more adventurous cub may be the one to walk into potential trouble first, or if the mother has gone off hunting, the cub that goes exploring through bushes, practicing its climbing skills and rustling the leaves, will more than likely be the one to unwittingly draw attention to itself from another predator. 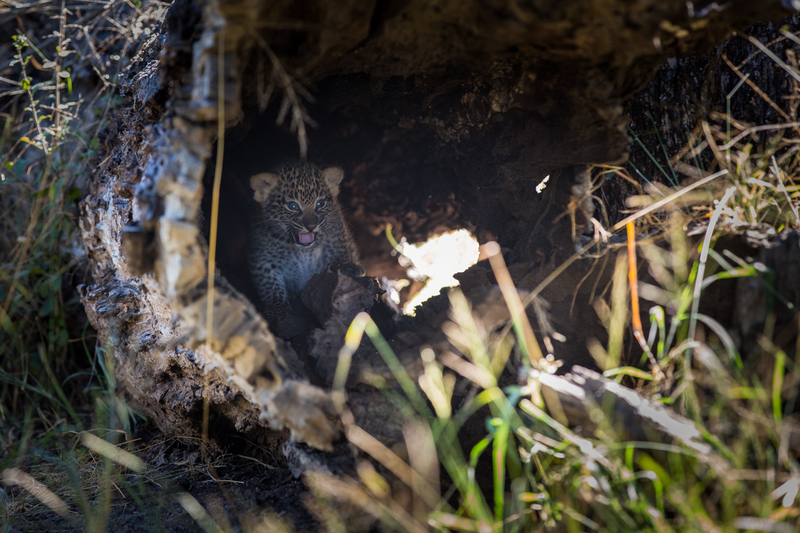 One of the Tamboti female’s cubs in on of their early den sites. What we are able to speculate on in terms of cub demeanour is only that which we see ourselves. Considering that for the vast majority of their day, leopard cubs go unseen, their activities and respective miens may be very different when no vehicle is there at all. Take the Tamboti female’s cubs for instance; given that the female is moving them quite regularly these days, and hiding them so well, they are found maybe four or five times a week. Say they are viewed for a total of two hours in each sighting, that makes it about ten hours per week, with the other 158 hours being theirs alone. Of course this will differ greatly depending on the week, but my point is simply that with leopard cubs, and indeed most of the predators – particularly leopards – our viewing of them is only a very small window into their lives. They remain unobserved most of the time, and we are obviously unable to make a judgement call based on what we don’t see. Maybe the cub that appears nervous to us is only unsure of the vehicle, and when no one is around it is the more confident of the two. Difficult to say. 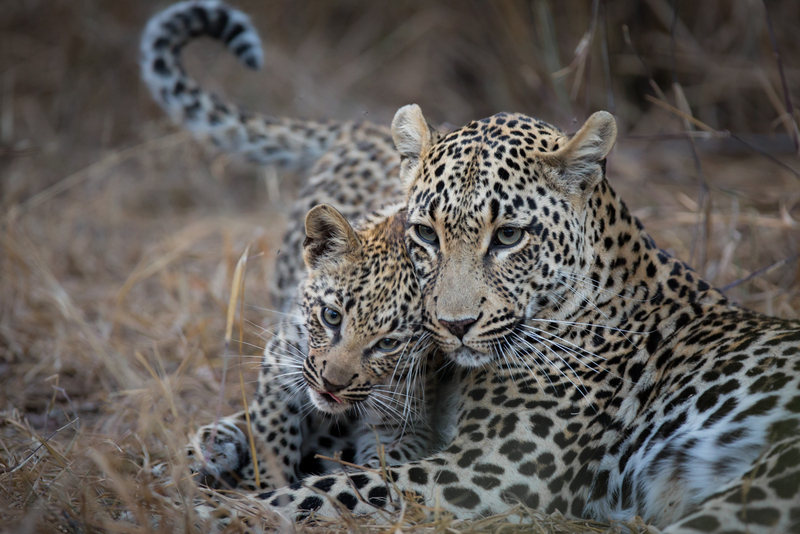 Fortunately, of the cubs currently viewable on Londolozi, the only pair that seems to have any kind of difference between their respective personalities of the two are those of the Tatowa female. The young female appears slightly more timid than the male, moving away slightly at the approach of a vehicle before once again venturing out when the Land Rover has parked quietly. All things considered though, it’s amazing how relaxed these two cubs are given that they have been viewed so infrequently. The male cub of the Tatowa female greets his mother. Will being seemingly slightly more confident bestow an advantage on this young male over the next few months? Love this story, and such wonderful pictures! The cubs being so different, reminds me of my daughters when they were young. They are grown now, and are both wonderful adults, however, still so opposite from the other. That is indeed what makes nature so unique..Especially Leopards. AS soon as one say, “this is what nature will do” it proves us all wrong. Absolutely, the interpretation and discussion is far more interesting than the simple recounting of facts anyone can read in a book! Interesting blog. Breeding cats many years ago I found that the kittens born first were the strongest and boldest of the litter. Can’t say if it is the same with wild animals. 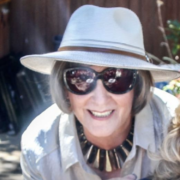 Hi Marinad, thanks for the comments. Interesting observation. Very difficult to say for sure of course as we can’t be sure which out of a litter would be born first, but it would make for an interesting study…! As discussed in http://blog.londolozi.com/2017/09/04/the-original-mother-leopard-end-of-a-lineage/, it’s very difficult to say for sure who the father of a litter is. 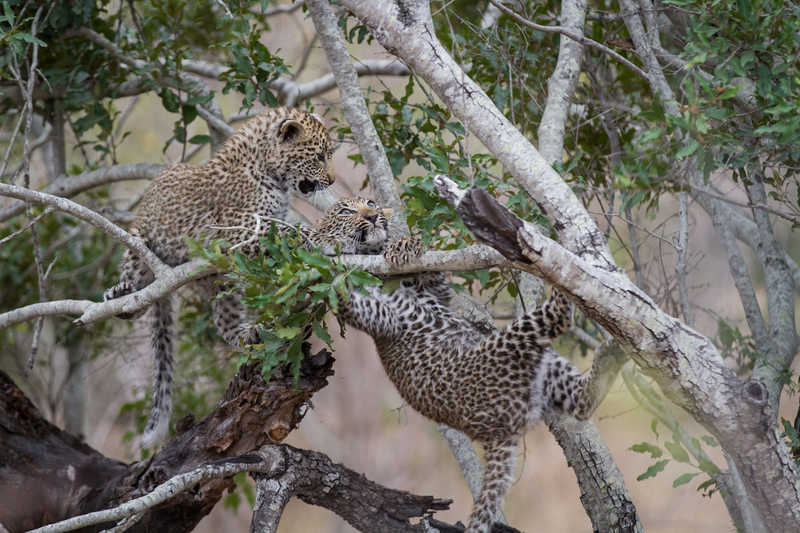 But if we had to go out on a limb and pick one male as fathering each of the above litters, The Tatowa females cubs are most likely fathered by the Inyathini male, the Nkoveni female’s by the Piva male, and then the Tamboti female could be either one, seeing as how her territory overlapped both males’ territories. An interesting observation you make there. You’re right. It’s really hard to predict which cub will survive in the long term. The one more gregarious could end up losing its life while the more timid cub thinks more of its surroundings and is more careful. In a perfect world they both would survive and we wouldn’t have this discussion. Super photos!